Restaurant: Union Bar & Restaurant Latino in Haverstraw. 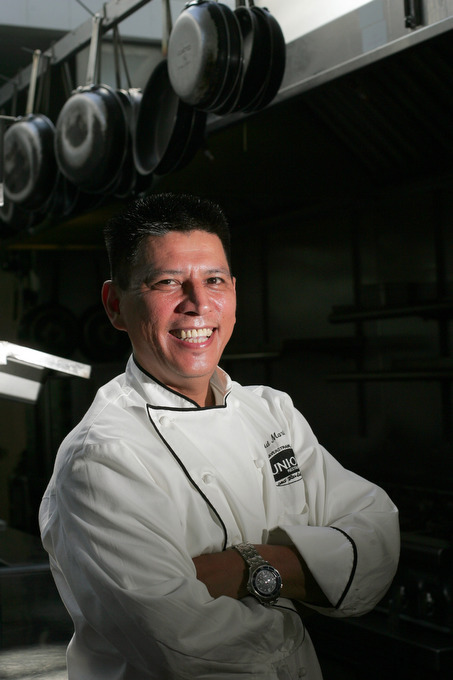 Experience: Martinez grew up on a farm, but didn’t gravitate toward cooking. He moved to the U.S. for a mechanic’s job, but instead found himself washing dishes at Peter X. Kelly’s Xaviars at Piermont. Six months later, Kelly moved him to the cold station doing salads at Freelance Cafe, next door. A year and a half later, Kelly took him to Gramercy Tavern for lunch. “That day, something in my mind clicked: That’s what I want to do. I started buying books, magazines, and started to look for restaurants to try out. See what everyone else is doing. I loved Patrias, and what Douglas Rodriguez was doing there. His tasting menu. That’s what I do here, with a twist. Nuevo Latino. He was with Peter Kelly for 19 years before opening up Union with partner Paolo Feteira. Cooking style or philosophy: Flavor is tops. Everybody can cook, but you look for a taste. I have to enjoy it myself. I like to combine simple ingredients together, in ways you wouldn’t maybe expect. Layers in your mouth. Simple ingredients put together well, with butter, cream and salt; tasting with a twist. Why we chose him: Hard work and dedication have paid off for Martinez, but they would be nothing without his talent. He knows how to combine classic techniques with the ingredients from his native El Salvador and create whole new flavors. How he keeps it fresh: I always am trying out new restaurants and seeing what’s out there, and when I get excited about something I’ve seen or tasted, it gets me thinking about what I’m doing. And I always think back to those days when I was young guy and working on cars, and I never thought this would be my life; never thought I would have my own place. Advice to new chefs: I like to see new ideas, pay attention, make that dish over and over and over, make it exciting, and keep learning. Look into other ethnicities for inspiration. Karen Croke contributed. Photo by Xavier Mascarenas/TJN.